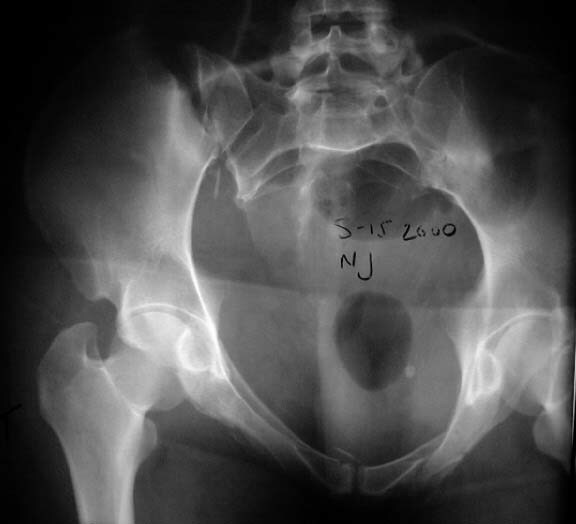 A woman in her 30's in a high speed MVC with this closed pelvic fracture. She's hemodynamically stable, no other injuries - belly, chest, and head are all fine. She also has a comminuted supracondylar femur fracture on the R side. The patient was previously healthy. She's thin. i'd try a closed reduction with percutaneous screw fixation. if the closed reduction was not anatomic, then i would open it, probably also with screw fixation. An external fixator for the anterior pelvis. From these x-rays, i can't tell if there is any acetabular involvement. 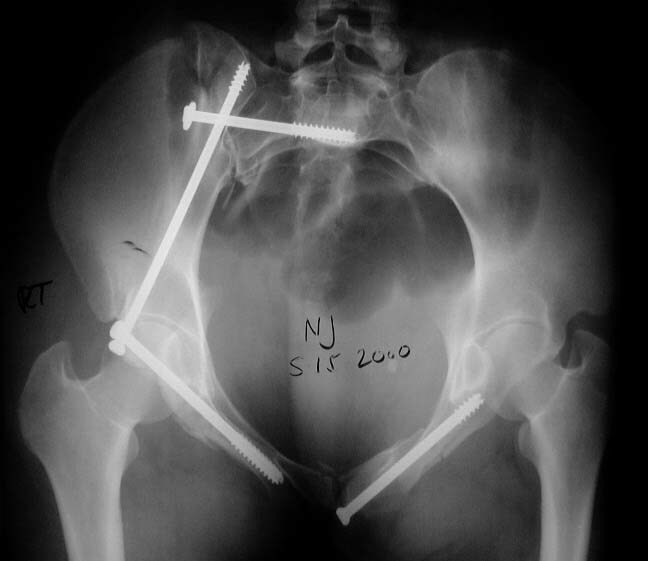 I would think this could be fixed via an anterior approach with a plate, posterior SI screws iif the redxn was anatomic with traction or even a trans iliac plate or rods from posterior. I tend to prefer the anterior plating approach for assurance of anatomic reductlion and avoidance of imaging problems on fluoro. 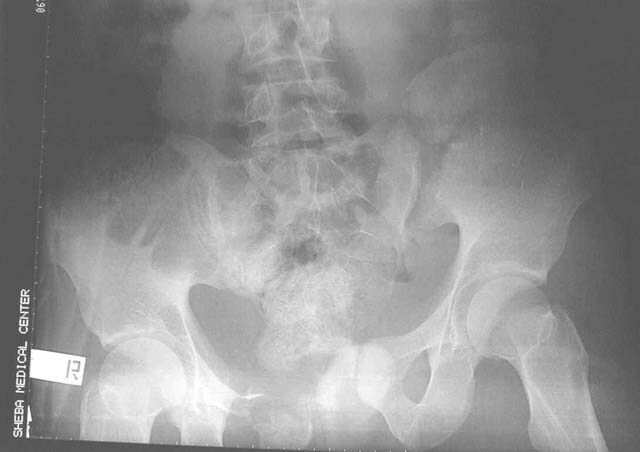 This is a vertical shear shear injury with a vertical fracture of the left pubic rami. I would place her in skeletal traction through the right femur to try to reduce the sacroiliac joint. 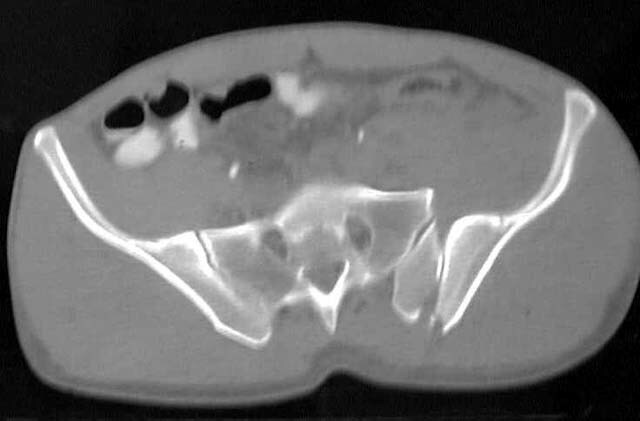 If successful, I would insert one or two iliosacral screws using the computer assisted CT image guided technique. 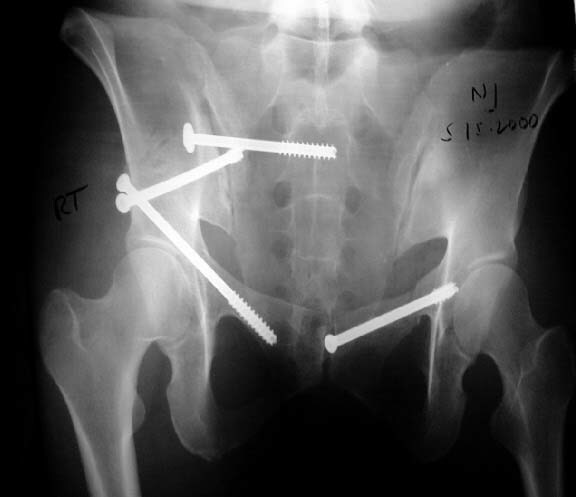 I would not use an exfix and would consider a percutaneous screw for the left pubis fracture as well. i'd try a closed reduction with percutaneous screw fixation . . . i can't tell if there is any acetabular involvement. There is no acetabular involvment. Strictly pelvic ring. 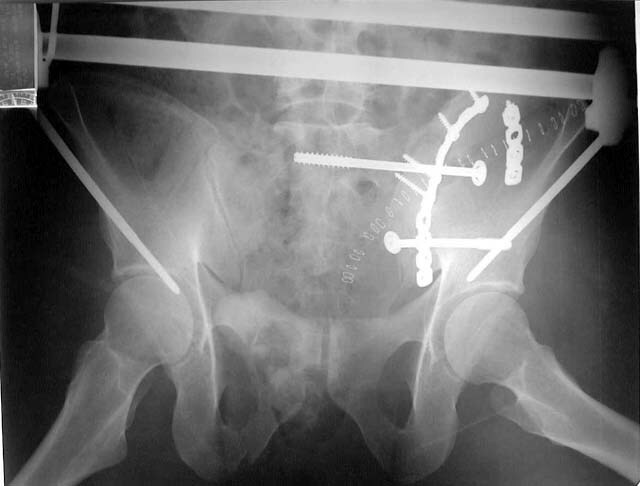 Where would you place your percutaneous screws? So, one vote for closed reduction and perc screw fixation, and one vote for ORIF. 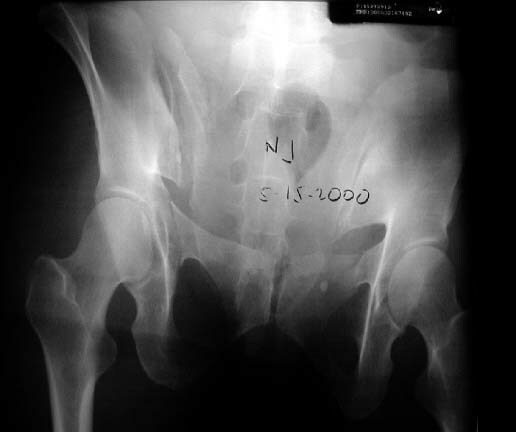 If you plate her via an iliac fossa approach, would you do anything to address the bilateral ramus fractures? For those who would open it, a question: who would go posterior, who would go anterior? If you CT a patient in traction, is the margin of error with the Stealth system still acceptable? We have a helluva time keeping traction on our patients while they're in CT. 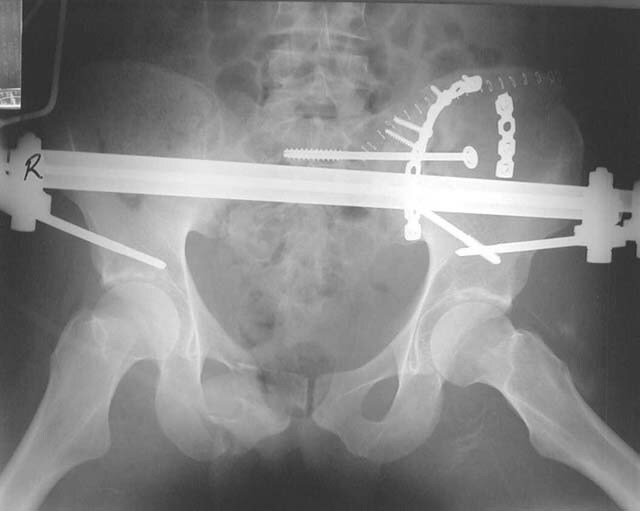 I haven't seen any severely displaced pelvic fractures treated with the Stealth, so I don't know what the limits of the technique are. 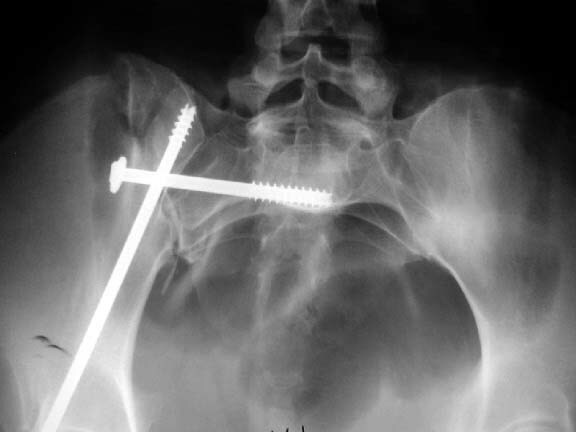 So, if your traction was successful, and the CT/Stealth worked, you would use perc iliosacral screws. Would you address the fx of the ilium, or would you simply pin the portion of wing anterior to the fx to the sacrum? 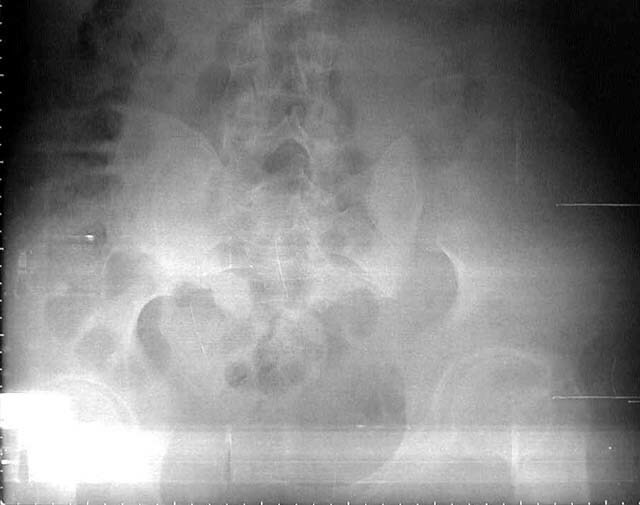 This is a vertical shear shear injury with a vertical fracture of the left pubic rami. your images are excellent quality, but as you know, we need more information. 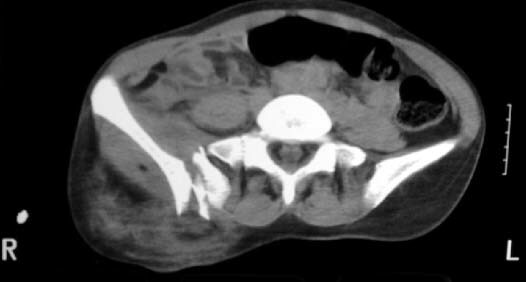 the enclosed ct image demonstrates her second, not upper sacral segment. 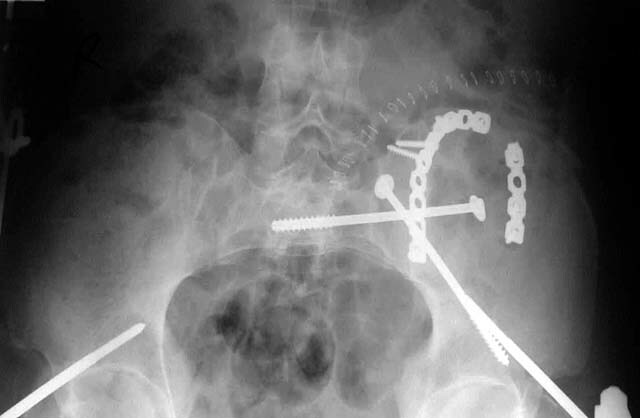 her plain pelvic radiographs indicate upper sacral dysmorphism, which has a significant impact on safe iliosacral screw insertion, regardless of imaging modality chosen to assist insertion. 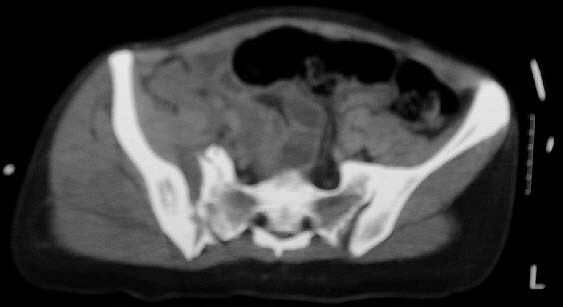 the ct image reveals no significant posterior pelvic degloving injury, for that single axial image. we need more ct info(images) to make appropriate therapeutic recommendations. until then, i'd recommend right sided traction of 10-15# (specific site dependant on femoral fracture treatment to date), and an air mattress. urgent/early/acute reduction and stable fixation are advantageous. the strategy relies on the other images which reveal the exact iliac fracture-sacroiliac disruption sites, local soft tissue condition, as well as the upper sacral morphology. Okay, here are the CT cuts I have. For those who would plate the posterior ring injury via an anterior approach, I've got a question. 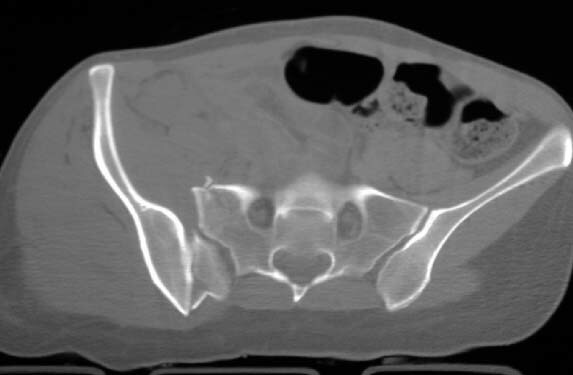 When you're plating a high iliac wing fracture like this, do you plate from the ilium to the sacrum? And would you fuse the SI joint at the same time? If you plan to plate across the iliac wing fracture, instead of from the ilium to the sacrum) do you think you could see the fracture very well thru an iliac fossa approach? I guess you'd have to detach the abdominal wall muscles all the way 'round to the back. You'd probably start to hit her paraspinous muscles, too. I've never done one of these fractures that way, so I have no idea how difficult that would be. Anybody have any experience with that? If the posterior soft tissues are in good condition, I would recommend a posterior approach with anatomic open reduction of the SI joint and iliosacral screw fixation. The soft tissues around her buttock are in good condition - no abrasions, no lava lamp lesion (how do you spell that word anyway? Maurel? Morel? isn't a morel a fungus? Maurice? Lavalay? We just call 'em lava lamp lesions down here in God's country). I COULD spell it (i.e. Morel-Lavelle) if I tried, you know. I took French in college. But, all my partners are rednecks. So there's no sense in putting on airs down here. Anyway, if you wanted to do a posterior approach the the sacro-iliac region, she's ready. 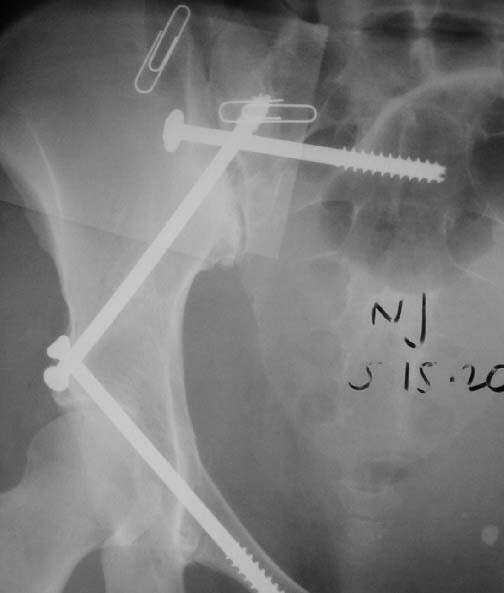 I would recommend a posterior approach with anatomic open reduction of the SI joint and iliosacral screw fixation. So you would fix the lower portion of the ilium to the sacrum and ignore the crescent fracture? 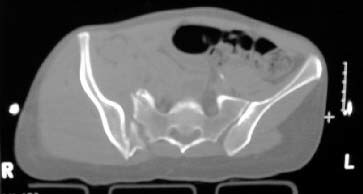 Or would you plate the iliac wing fracture at the same time you fixed the ilium to the sacrum? Andy Burgess would probably classify this as a CMI--Combined mechanism of injury. It seems to have features of VS, but is mostly lateral compression. I see what I think is a classic crescent of the LC2 on plain films; I ususally fix pure LC2s (open, posteriorly) with two long 6.5 mm screws from the crescent directed toward the sciatic buttress, with no fixation across the SI joint ( they usually don't require anterior fixation because of intact anterior soft tissues). 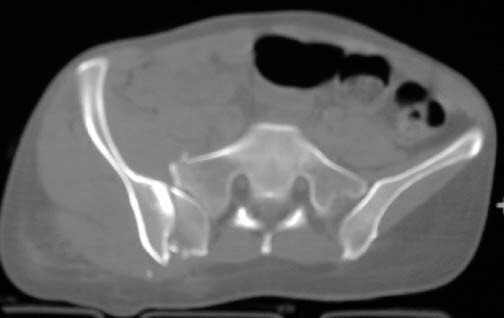 The CT cut you sent makes it look like a sacral fracture with an intact iliac wing, though. 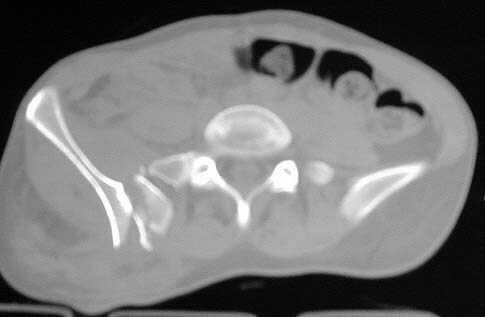 Can you send a CT cut that's about 1 cm cephalad? I almost always try to get these closed, but becuase I believe the quality of reduction is as important as excellent stability, I'd have a low threshold for opening this one. 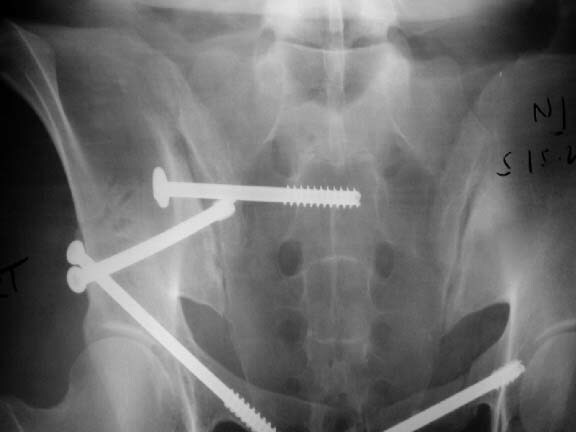 If it's a sacral fracture, I would open it anteriorly and place percutaneous SI screws (one in S1 and one in S2), maybe two transarticular plates. If she's supine you could do some gentle testing (kinda like a push-pull) to determine the need for supplemental anterior fixation. A single retrograde medullary ramus screw doesn't fix all three anterior fractures, so I'd probably go for a two-pin Hannover type frame ( to avoid the dissection associate with plating) if I thought something was needed in front. If the crescent fragment will allow then I would place a 6.5 partially threaded screw between the tables of the ilium just above the sciatic notch to lag the fragment back. If it is comminuted and mobile then a 3.5 recon plate could be used. My feeling is that the ilium with anterior SI joint needs to be reattached to the sacrum. This may require 1 or 2 iliosacral screws depending on the available room in the S 1 body and the purchase of the 1st screw. I have on one occasion had to place the iliosacral screw through a 4.5 recon plate because the entry point through the ilium was too close the crescent fracture line. The posterior approach allows you to see the fracture line and make sure your iliosacral screw does not go through it. My treatment for this kind of patient is usually closed reduction and placement of ilio sacral sacral screw using Stealth for assistance in guidance. That's what Fred Barrick said, too. I don't have any experience using Stealth in the pelvis. How do you go about it? Do you put them in traction and then get a CT to see how close you are to a reduction at the SI joint? And then use the CT images to guide screw placement? What do you do if the reduction in traction isn't adequate? Do they get open reduction then? My understanding is that once you move the fracture fragments around, the CT images saved in the Stealth system are no longer any good. Is that right? If that's the case, then I guess you couldn't manipulate the fracture in the OR and still use the Stealth to guide your screw placement. 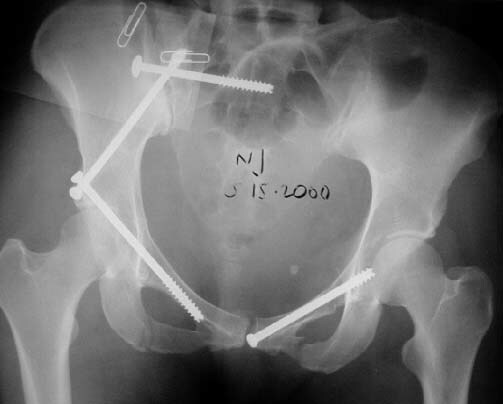 If you did open it, would you plate the iliac wing fracture and then stabilize the SI joint injury? Or would you just pin the iliac wing to the sacrum with iliosacral screws, and ignore the iliac wing fx? Here is an example of a Young-Burgess CMI (LC2/VS) pelvic fx, quite similar to the case presented by Adam Starr, fixed by ORIF posteriorly + anterior bridging exfix. Nice reduction! That looks pretty darn good. I guess you did him prone to open and fix the sacro-iliac joint fracture dislocation, then flipped him supine to place the ex-fix? How long did you leave the ex-fix frame in place? I think that Joel Matta has shown that you don't need anterior fixation, otherwise nice reduction. Yes, the posterior approach has been done prone. I'm using the OSI radiolucent table and applying traction (skeletal), during the procedure. Usually, SI screw is not needed, but in this particular case, the SIJ remains slightly open on its lower part. For anterior plating, the exposure is very good. You release the muscles all the way back, but do not get into the paraspinals. You plate across the SI hjoint, but I as a rule do not primarily fuse that joint. Thanks for the thoughtful reply. The potential for vascular injury wasn't something we worried about, but we probably should have. Lessons learned, I'll remember next time. I bet the incidence of occult vascular injury with these is pretty high. I have attached the pictures of what we did. We got her into the OR the day after injury. We applied manual traction to the thigh and flexed the hip a bit. I pushed the iliac wing medially using a screwdriver placed thru a little stab wound. Once we had put the wing back together with the front-to-back screw, we pinned the ilium to the sacrum. I was chicken to use S1, due to the dysmorphism, and her S2 body was a big, easy shot. The ramus fractures still had a little motion with stress, so we fixed them, too. Then we ORIF'd her supracondylar femur fx. It was a shattered mess. She's doing okay so far. Her knee is going to be her biggest problem, I think. I have attached the pictures of what we did. Hello Adam, Looks fantastic! I have never seen such treatment pattern for this type of injury. If forget about her femur, when and how would you mobilize the patient? when and how would you mobilize the patient? We have her up with a walker now, "foot flat" weight bearing. She rests her foot on the ground while standing, but bears weight on her other leg and arms during gait.